Synopsis: Although Mary, Queen of Scots continues to fascinate both historians and the general public alike, the story of her mother, Marie de Guise, is much less well known. A political power in her own right, she was born into the powerful and ambitious Lorraine family, spending her formative years at the dazzling and licentious court of François I. Although briefly courted by Henry VIII, she instead married his nephew, James V of Scotland, in 1538. James' premature death four years later left their six day old daughter, Mary, as Queen and presented Marie with the formidable challenge of winning the support of the Scottish people and protecting her daughter’s threatened birthright. Content until now to remain in the background and play the part of the obedient wife, Marie spent the next eighteen years effectively governing Scotland, devoting her considerable intellect, courage and energy to safeguarding her daughter’s inheritance by using a deft mixture of cunning, charm, determination and tolerance. The last serious biography of Marie de Guise was published in 1977 and whereas plenty of attention has been paid to the mistakes of her daughter’s eventful but brief reign, the time has come for a fresh assessment of this most fascinating and under appreciated of sixteenth century female rulers. My Review: Marie de Guise was mother and regent of Mary. Queen of Scots. Even though she ruled Scotland effectively, her accomplishments have largely been overshadowed by Mary, Queen of Scots failures. 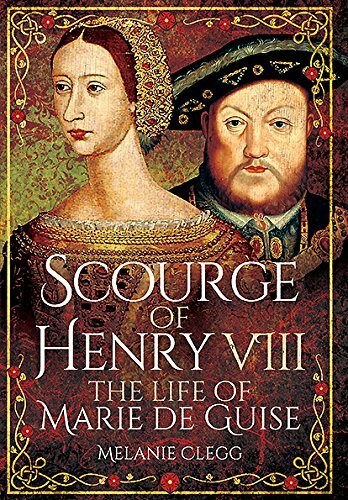 In the first biography of Marie de Guise in over thirty years, Scourge of Henry VIII brings Marie de Guise’s story to light. Marie is portrayed as a woman of keen intellect, charm, hard-working, and energetic as she continually fought to secure Mary’s inheritance. Marie de Guise was from the powerful de Guise clan. When she was eighteen, she married the Duc de Longueville. She gave birth to Francois d'Orleans. The marriage was happy, but short-lived. Louis fell ill and died, leaving Marie de Guise a widow at the age of 21. Marie de Guise was happy enough to remain single. Unfortunately, she had two royal kings seeking her hand in marriage, James V and Henry VIII. 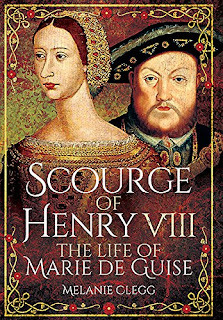 According to this biography, Marie de Guise was inclined to marry Henry VIII. However, she left the decision to King Francis of France. King Francis wanted to keep up the alliance between Scotland and France and agreed to let James V have Marie. Marie married James V through a proxy marriage and sailed for France. Her marriage to James was short-lived. She had five children, but only Mary, Queen of Scots survived. Defeated by the English at the Battle of Solway Moss, James fell ill and died leaving his daughter Mary queen at 6 days old. The regency of Mary, Queen of Scots fell to the Earl of Arran instead of Marie. It would take twelve years for her to be Regent, in which she ruled for eight years. She struggled with the rise of Protestantism, her conflict with England, and keeping her daughter’s inheritance secured. Thus, Marie De Guise’s struggle for power was long, but she continued to hold power till her death. Overall, this biography showed Marie de Guise to be a capable and politically-adept ruler. Scourge of Henry VIII is a comprehensive and light read for the general reader. There were a few historical errors, and I thought that there should be a more appropriate title for this biography. Nevertheless, it sheds light on Marie de Guise’s accomplishments. Marie de Guise learned from her mother-in-law Margaret Tudor’s failures. While Margaret’s marriages made her lose her authority as regent, Marie de Guise did not remarry so that she could still keep her authority. Mrs. Clegg compares her to Elizabeth because the two made sacrifices for their realm. Thus, Marie de Guise was a better ruler than her daughter, who has largely eclipsed her in fame. Hopefully, Marie de Guise’s story will be more known and she will be given the attention and credit of a capable ruler as she deserves.